This is one Immaculate 2014 Ford Crew Cab Lariat! 6.7 Power Stroke that is a 1 Owner truck and comes with a Clean Carfax! New Wrangler Kevlar Tires and White Platinum Tri-Coat paint! This truck is absolutely loaded with options which include....Heated and Cooled Leather Seats, Navigation, Backup Camera, Sunroof, Heated Second Row Seat, Dual Power Seats, Full Power Mirrors, Bluetooth, Mounted Audio Controls, Tow Package, Weather Tech Floor Mats, Dual Climate Control, Under The Seat Storage Box, Encore Bed Cover, Park Assist Sensors, Trailer Brake, Remote Vehicle Start, Keyless Entry and so much more! 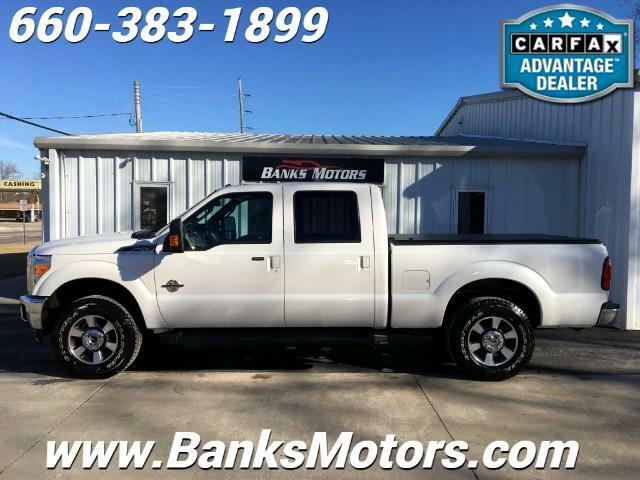 This Power Stroke Lariat is one of the Cleanest Pre-Owned Trucks You Will Find Anywhere In The Nation! We are located in Clinton, MO, less than an hour southeast of Kansas City! No Games, No Gimmicks, Just the Right Way of Doing Business!